MayWorks is an annual month-long celebration of workers’ culture and history. While Canada has carried the tradition for years, the Washington State Labor Council, AFL-CIO first organized MayWorks in 2012 to commemorate the 200th anniversary of the 1812 Bread and Roses March. Since 2012, MayWorks events have popped up around the state every year — celebrating our past and present cultural lives. If you prefer to celebrate MayWorks from the comfort of your own home, check out this LABOR BOOK & FILM LIST, courtesy of the Everett Public Library! Labor Barbecue at 5 p.m. at the Everett Labor Temple, 2810 Lombard St. — All union members and their families are invited to join the Snohomish County Labor Council to gather and socialize, enjoy some barbecue, and celebrate the original Labor Day. For details, call 425-259-7922 or email Charlotte Murry. 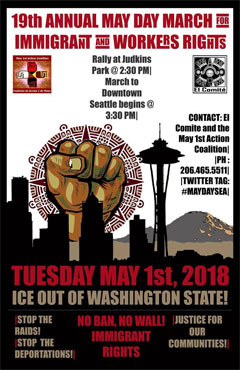 19th Annual May Day March for Workers and Immigrant Rights at 2:30 p.m. at Judkins Park, 2150 S. Norman St. in Seattle — El Comité and the May 1st Action Coalition are calling on all workers and all social justice advocates to come out on Tuesday, May 1 (International Workers’ Day) for the 19th Annual May Day March for Immigrant and Workers Rights in Seattle. A preliminary program will begin at Judkins Park at 2:30 p.m. The march to downtown will depart from there at 3:30 p.m. (A labor contingent will meet at the WSLC office, 321 16th Ave. South, at 2:30 p.m. for sign-making and will join the march as it passes by the office shortly after 3:30 p.m.) Get details. The WSLC, Casa Latina, and Studio Lazo invite all to view Fulgencio Lazo: In Celebration of Immigrant Workers. The exhibit, consisting of six, large-scale sculptures in wood, will run May 1-30 at 1614 S. Jackson Street, Seattle, 98144, with gallery hours Friday through Sunday, 4-7 p.m. and by appointment. May 1 it will be open noon to 4 p.m. to coincide with the 19th annual May Day March. Members of the labor contingent meeting at the WSLC office at 2:30 p.m. for sign-making are urged to stop by (it’s one block up the street) and visit this exhibit. Get details. Keep Marching book event at 7 p.m. at Elliott Bay Book Company, 1521 10th Ave. in Seattle — Join MomsRising co-founder Kristin Rowe-Finkbeiner and U.S. Rep. Pramila Jayapal as they discuss Kristin’s new book, Keep Marching: How Every Woman Can Take Action and Change Our World. Get details. Michael Honey book reading at 5 p.m. at UW-Tacoma’s William Phillip Hall, 1918 Pacific Ave. — Join Michael Honey as he talks about his new book, To the Promised Land: Martin Luther King and the Fight for Economic Justice, which goes beyond the iconic view of Martin Luther King Jr. as an advocate of racial harmony to explore his profound commitment to the poor and working class and his call for “nonviolent resistance” to all forms of oppression, including the economic injustice that “takes necessities from the masses to give luxuries to the classes.” Get details. 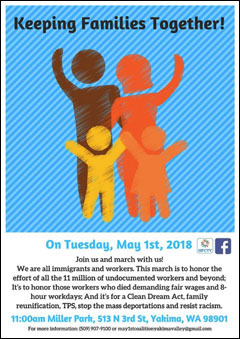 Keeping Families Together March, Manteniendo alas Familias Unida from 11 a.m. to 2 p.m. at Miller Park, N. 4th St. — Every year, the May 1st Coalition hosts a peaceful march in good faith that our community will see federal action taken to fix our country’s broken immigration system. We wholeheartedly believe the Yakima Valley is in dire need of a solution from lawmakers. The distress of deportations and raids across our communities continues to cause great suffering for many families. Get details. Free Community Screening of Dolores from 6:30 to 8:30 p.m. at the Centilia Cultural Center, 1660 S Roberto Maestas Festival St. in Seattle — Didn’t get a chance to see Dolores yet? Join Seattle City Councilmember Teresa Mosqueda for a free community screening of Dolores. There will be fun activities and amazing food vendors. Bring your kiddos and celebrate all that we have accomplished in the labor movement. Get details. Labor Hootenanny from 6 to 8:30 p.m. at ILWU Hall, 1306 Alexander Ave. E. in Fife — Join the Pierce County Central Labor Council and union sisters & brothers for an evening of musical solidarity featuring great songs of labor, peace, and justice. Musicians are welcome to bring an acoustic instrument and a song to share or just join in the jam. This is a fun, participatory event and everyone is encouraged to sing along. Printed lyrics for most songs will be available. Light refreshments will be provided. Admission is free. Get details. “Creating Our King County” kickoff event — 10 a.m. to 1 p.m. at Laborers Local 242, 22323 Pacific Hwy S. in Des Moines — MLK Labor is hosting this event to share all of the exciting developments happening across King County, including the new Arena at the Seattle Center, the Convention Center addition, affordable housing, the Sound Transit System Expansion, the SeaTac Airport Expansion, and more! This is a FREE family-friendly event. There will also be union job opportunities on these projects. Get details. Michael Honey and La TaSha Levy at 7:30 p.m. at University Lutheran Church, 1604 N.E. 50th St. — Michael Honey will discuss his new book, To the Promised Land: Martin Luther King and the Fight for Economic Justice. He’ll be joined in conversation with La TaSha Levy, who teaches American Ethics Studies and courses on African American history at the University of Washington-Seattle. Honey and Levy will explore King’s profound commitment to the poor and working class, and his call for nonviolent resistance to all forms of oppression―including the economic injustice that “takes necessities from the masses to give luxuries to the classes.” Get details. Dramatic Reading of “Frozen By Fire” at 3:30 p.m. at Aljova Thornton Place, 4th Floor Conf. Room, 450 N.E. 100th St. — Don Kentop, a published poet, will give a dramatic reading from “Frozen by Fire”, his collection of documentary poems about the tragedy that changed American labor history and our lives, the Triangle Shirtwaist Factory Fire of 1911. He will be assisted by Aljoya residents who will read from survivors’ accounts of the fateful day. Get details. Washington Women in Trades 39th Annual Career Fair from 9 a.m. to 2 p.m. at the Seattle Center’s Fisher Pavilion — Every spring for the last 39 years, Washington Women in Trades has created a place where more than 1,000 people gather; some teach, some learn, some recruit, some apply for jobs, some are hired! Get details. Preserving Solidarity: Women in Trades at 1 p.m. at the University of Washington’s Walker Ames Room — Join us for the Labor Archives of Washington’s Fourth Annual Event on the history of Women in the Trades. LAW’s annual event is a chance to celebrate collections that we have on tradeswomen, invite the community to learn about this important history, and to announce a collecting initiative on women in the trades. Get details. Building Our Asian Pacific Alliance Power from 3 to 5 p.m. at the Wing Luke Museum, 719 S. King St. — This API Heritage Month event will celebrate the rich and diverse API community and a discussion of building power for the API workers and community. It is sponsored by the Asian Pacific American Labor Alliance, SEIU Healthcare 1199NW, SEIU 925, SEIU 775, and the SEIU API Caucus. Get details. Washington Alliance for Retired Americans annual convention starting at 9 a.m. at the WEA Union Hall’s Fern Room, 32032 Weyerhaeuser Way S. — Details to come. Free Screening of Dolores and Discussion with Director at 5:45 p.m. at El Centro de la Raza, 2524 16th Ave. South — Didn’t get a chance to see Dolores yet? Join the film’s director Peter Bratt for a free screening and hear him describe his experience making this film about Dolores Huerta, a working-class wife and mother of 11 who co-founded the United Farm Workers union. Free screening of The Children’s March from 6 to 8 p.m. at the Washington State Labor Council, 321 16th Ave. South — The Coalition of Black Trade Unionists invites all to this movie night featuring The Children’s March, a 2004 documentary film about the Birmingham, Ala., civil rights marches in the 1960s, highlighting the bravery of young activists in Children’s Crusade (1963). Latina Women’s Symposium at 6:30 p.m. at Burke Museum Lobby, 1413 N.W. 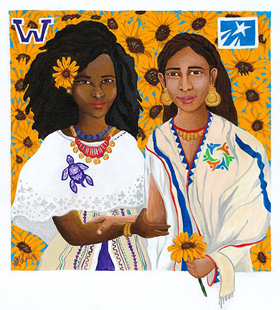 45th St. — The Latin American and Caribbean Studies program at the University of Washington and the Simposio de Mujeres Latinas at North Seattle College are bringing their hands together to cultivate saberes sin fronteras. Join us for a reception and keynote address by Seattle City Councilmember Teresa Mosqueda. Get details. Our Time Has Come movie premiere at 1 p.m. at William H. Foege Hall, 3720 15th Ave. NE — Details to come. John O’Connor, Rebel Voices & Tim Hall in concert at 7:30 p.m. at the Washington State Labor Council’s Main Hall, 321 16th Ave. South — All that PLUS a special reunion of Shays’ Rebellion! Don’t miss this evening of fun and music! Suggested donation is $15/person. For more information, email Janet Stecher or call 206-551-0818. Fulgencio Lazo: In Celebration of Immigrant Workers at 7 p.m. at Studio Lazo, 1614 S. Jackson St. — Fulgencio Lazo has created eight, large-scale sculptures in wood celebrating immigrant workers. On Wednesday, May 23 at 7 p.m. Studio Lazo, 1614 S. Jackson St., will host a program featuring remarks by Professor Lauro Flores of the University of Washington and a brief opportunity to hear directly from Fulgencio about his process and inspiration. The event is free and all are welcome. (The exhibit is open May 1-27, with gallery hours Friday through Sunday, 4-7 p.m. and by appointment.) Get details. Labor Showcase at Northwest Folklife from 7 to 9 p.m. at Seattle Center’s Cornish Playhouse (Mercer St. side) — Featuring: John O’Connor, Linda Allen, Jerrell Davis (Rell Be Free), and the Seattle Labor Chorus with a Climate Justice musical docudrama. Posted by David Groves on Apr 27 2018. Filed under W.S.L.C.. You can follow any responses to this entry through the RSS 2.0. Both comments and pings are currently closed.